Terry, owns the Buffalo Bills of the NFL and Buffalo Sabres of the NHL. After winning her second Challenger doubles title in two weeks, Maria Sanchez gave away her plaque. Not that the 25-year-old Modesto product was unappreciative. Sanchez, who teamed with Francoise Abanda to win the $50,000 Boyd Tinsley Clay Court Classic in Charlottesville, Va., on Sunday, was so moved by a fan's story about losing one of her legs a few years ago that she gave her the award. "She deserved it more than I did as she's gone through so much but still manages to bring light into people's lives," Sanchez wrote on Instagram. "That's the name of the game! Definitely what I needed after a hard week!" The unseeded Sanchez and Abanda, an 18-year-old Canadian sensation, dominated third-seeded Olga Ianchuk of Ukraine and Irina Khromacheva of Russia 6-1, 6-3 for the title. Sanchez also won the doubles crown in the $50,000 Challenger in Dothan, Ala., with Johanna Konta of Great Britain last week. Sanchez has reached the doubles final in three of her four appearances in Charlottesville. She won the 2012 title with since-retired Yasmin Schnack of Elk Grove in the Sacramento area and was the runner-up last year with Irina Falconi of West Palm Beach, Fla.
Also for the second straight week, Sanchez lost in the first round of singles to American Jessica Pegula in straight sets. Pegula's billionaire father, Terry, owns the Buffalo Bills of the NFL and Buffalo Sabres of the NHL. 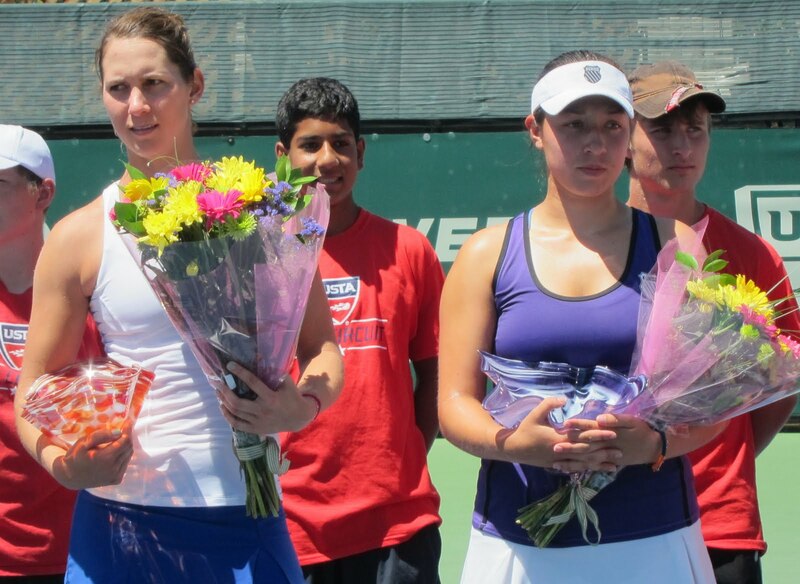 Sanchez, however, defeated Pegula to win the inaugural FSP Gold River Women's Challenger in the Sacramento area in 2012. In the Charlottesville singles final, Allie Kiick outlasted Katerina Stewart 7-5, 6-7 (3), 7-5 in a 3-hour, 5-minute battle of unseeded American teenagers for the biggest title of her career. Kiick, 19, is the daughter of Jim Kiick, a running back on the undefeated Miami Dolphins team of 1972. Stewart, 17, also lost in the Dothan singles final to Louisa Chirico, 18, of Harrison, N.Y.